“I came to you for a job”. It’s a line uttered by Willem Dafoe at the beginning of The Hunter, where he’s tasked with a mission to obtain biological samples of a Tasmanian tiger – an animal thought to be extinct. While Daniel Nettheim’s picture weaves various plotlines together, the one thematic element he acknowledged with finesse is how a profession can construct an individual’s identity. 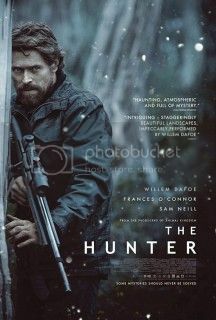 It’s the case with Willem Dafoe’s character in The Hunter, where he studies the landscape with tenacity, assimilating to the terrain with mechanical ease. The success of this narrative thread is unfortunately diluted by Nettheim’s uneven hand, as the various narrative threads that function as a framework become too muddled and unfocused. Martin David (Willem Dafoe) assumes the role of a scientist sent by a university to study the Tasmanian wilderness. It’s a cover up to disguise his true intentions, but regardless of why he’s exploring the terrain, there’s hostility at every turn. In fact, the harsh wilderness can almost be considered a refuge from the boiling socioeconomic turmoil that afflicts the townspeople. Bunkering down with a mother and her two children during his visit, David is exposed to the human aspects of life. As one can expect, the human aspects of the narrative overwhelm David’s life, as he begins to lose focus on his assignment. Meanwhile, the social unrest of the community begins to takes its toll on the family, as David’s intentions are questioned by a town leader named Jack (Sam Neill). The Hunter recalls the 1997 Jim Sheridan film, The Boxer. Both films attempt to take aspects of genre filmmaking and integrate it within a sociopolitical backdrop. But both pictures begin to lose sight of their genre roots and allow other aspects of the narrative to muddle the proceedings. Nettheim’s direction is particularly lacking, as he moves from scene to scene without a larger unifying framework to keep it all together. And as he introduces new concepts and narrative threads, he can’t keep the ship on an even keel, forcing false moments of realization without building a framework to support his ideas. It’s simply a jarring experience that fails to achieve on a promising concept. The Hunter really could have benefitted from someone with a more methodical directorial vision who would have been able to tie the various pieces of the narrative together. Julia Leigh, who wrote the novel The Hunter is based on and directed last year’s Sleeping Beauty, is the obvious choice here.